Harriett Baldwin today visited Tenbury Wells to see the Market Street toilets being demolished and to discuss the situation with local businesses and residents. She said, "I was impressed by the community spirit in Tenbury Wells. Some shops are returning to normal. I was impressed to see Whites Café is open again after their third flood in a month. Other businesses are partly open again, but many will be shut for months. A lot of help is going to be needed in both the short term and the long term." Later she will accompany David Cameron and Sir Michael Spicer to Upton-upon-Severn to meet many of the local heroes who have shown such indomitable spirit in the Town. Harriett Baldwin added, "There are so many issues that need to be addressed. For example, I hear that traders are being swamped by sales calls from what can only be called loan sharks offering short-term loans. Insurance adjusters are unclear about whether the three floods will attract three excess payments by property-owners or just one. 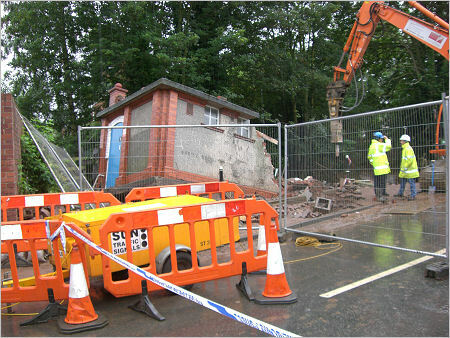 However, it is good news that the Tenbury Wells Market Street toilets were insured and will be rebuilt as soon as possible."